An overarching goal of our work in the area of LGBTQ2S+ parenting is to improve the quality and accessibility of health and social services for all LGBTQ2S+ parents and prospective parents. 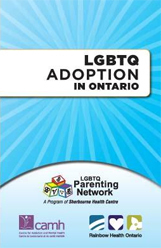 One of our earlier studies addressed this goal by focusing on LGBTQ2S+ adoption: Lesbian, gay, bisexual, transgender, transsexual, and two-spirit adoption in Ontario: Policy, practice and personal narratives. We collected survey data from 44 adoption agencies in Ontario (97 were asked to participate). We found that only 13 agencies had a policy regarding adoption by LGBTQ2S+, most of which were public, secular agencies in larger urban settings; only 16 actively recruited LGBTQ2S+ adoptive parents, i.e., table at community organizations or events (i.e., Pride); and only 3 of 44 agencies/individuals who participated indicated that they had received education about specific needs and concerns of sexual and gender minority prospective parents. We also interviewed LGBTQ2S+ adoptive parents to learn about their stories of adoption, beginning with their decisions to pursue adoption and closing with their experiences since the adopted child(ren) joined their family.